Your organisation is running a survey for teaching staff. If this is the case, there will be local information about why the survey is being run and how the results will be used. 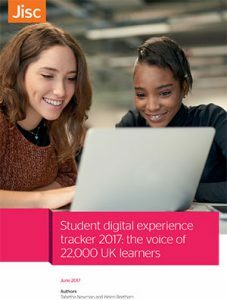 Your organisation is running the Digital student experience tracker with students and you want to know more. You’re just interested to know more about the project. The information on this page is especially for teaching staff. The links on the page and in the menus are to information for people who are involved in other roles. You’re welcome to explore – we are completely open about our purpose and process – but you may find that information does not address your concerns directly. If you have any questions or concerns that are not answered here or in your own organisation, please contact us. We will add to this page based on what teaching staff tell us you want to know. 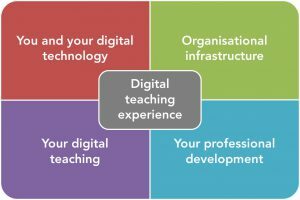 What is the ‘student digital experience‘ exactly? Students’ first contact with their place of study is usually online, and many induction processes happen online pre-arrival. Students’ sense of their place of study and their role in it is often mediated through digital systems – virtual learning environments, library systems, assessment systems, learner data systems, course information systems etc. Students expect their learning providers to offer a range of digital services, from reliable wifi and printing to online course materials and learning support. 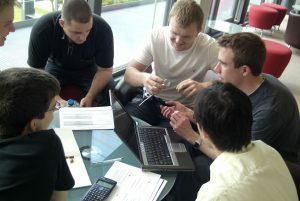 Courses of study typically include digital practices of the relevant subject area, as an integral part of the learning. Courses of study typically include elements of online, blended or ‘technology-enhanced’ learning as organisations adopt these approaches. Digital capabillities are important aspects of employability, and often included in course outcomes and graduate attributes. 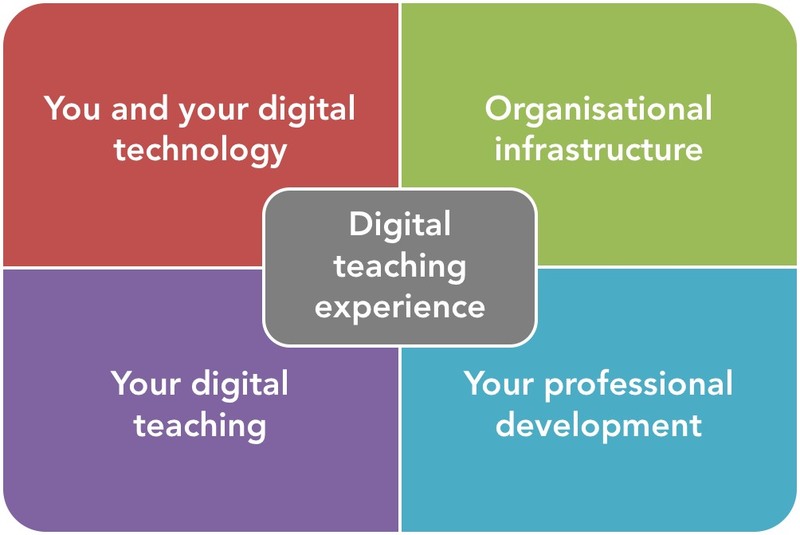 We see all these as aspects of the digital curriculum. Our approach engages students in dialogue about both the digital environment for learning and the digital curriculum (see below). Organisations collect a lot of information about students, but we found they did not collect evidence about these digital issues consistently, or coherently, or in many cases at all. Students were telling us that they did not have opportunities to discuss their digital experience or engage in projects to improve it. The Student digital experience service was developed in response to these findings. Over two years of intensive piloting (2016-18) we have involved over 150 organisations and tens of thousands of students. 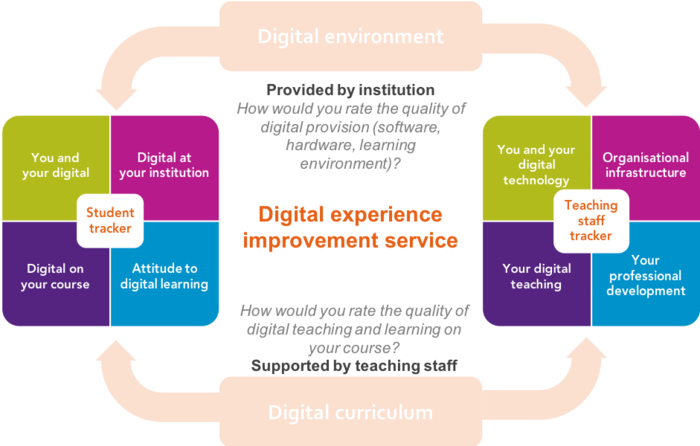 In addition, having access to so much evidence about students’ digital experience allows Jisc to write reports and make policy recommendations to sector bodies. The report on the findings of the 2017 Tracker has been very influential for example. It shows the kind of evidence that might be gathered and analysed at your own institution. So what is the Student digital experience service (sometimes called the ‘tracker’)? Organisations are free to use different elements of the service, which is why as a member of teaching staff you may encounter it in different ways. Why and how are teaching staff involved? We all know that student surveys have a mixed press at the moment. One reason is that students see data being siphoned off to create a national benchmark, rather than being owned and analysed locally, with their involvement. Our service addresses that concern with our focus on engagement, and with a data co-ownership model that gives organisations the power to analyse and use their own data exactly as they choose. We strongly recommend that students and teaching staff are involved at every stage. using the findings in your own work to support students more effectively. This diagram explains how the staff and student surveys are connected. We ask students to respond to the digital environment and their digital learning and teaching experience. We ask staff to respond to the digital environment from their perspective. We also ask them about how they are supported, especially through professional development, to provide a high quality digital teaching and learning experience to students. What’s in the teaching staff survey and why should I take part? Some of these are closed questions which can be compared and benchmarked with other organisations. Some are open questions, allowing you to report on your experience in your own words. Still others can be customised by your institutional lead, so you may find questions that relate to specific local issues. Taking part in the survey has no personal benefits – it is entirely anonymous. Collectively, however, it allows you to have your say, and play your part in highlighting issues that need attention. Locally, your responses are held securely and anonymously. Your organisation can only see summative data and can’t trace individuals or small groups of staff. The survey system we use (BOS) has been developed specifically for use in education and has the highest standards of data security and protection. Through our data co-ownership model, we at Jisc can see summative data from all the participating institutions. We only publish that data in an aggregate form, so individual organisations are never publicly identified or compared. We use aggregated data so that we can learn and share lessons at a national and international level. Explore the tracker section of this web site and blog posts relating to the tracker for more information. Contact your local coordinator. Details should be on any publicity about the service, which may be called something different in your organisation but should carry a Jisc logo as you see at the top of this page. Follow @Jisc and #digitalstudent on social media.